The startup “Young leaders of Yamal” is taking place in Salekhard in Yamal multidisciplinary college within the Arctic educational forum for schoolchildren and students of the region. The event is being held for the first time in the region and brought together schoolchildren from 13 municipalities and students from six colleges and one technical school. Classes are being held under the guidance of the guest teachers – a game-technician Aleksey Ilyin and the head of the project “Games of the future”, a lecturer Maria Rachinskaya. Tutors — 21 pedagogues from among the holders of the grant “The New Teacher of Yamal” and representatives of the regional council of young pedagogues are helping the young leaders to open up and develop ideas. At project sessions the participants are developing social strategic projects and learn how to be leaders. 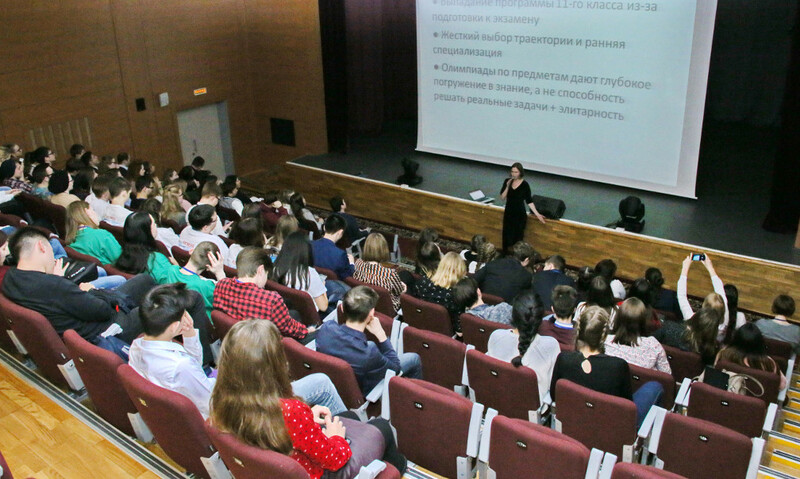 According to the information given to a correspondent of the news agency “Sever-Press” by Aleksey Ilyin, the task for all three days is to lead the young people from the project idea to the social franchise, which can be applied in municipalities of the region. Thus, today is dedicated to work with targeted audiences, beneficiaries of the project and the roadmap. “The young people are developing quite feasible local projects. Their competence, which allows them to interest and to involve right people in their project, is the main resource that they need. We teach the young people how to work directly toward the clean copy, to involve their friends and acquaintances, teachers and coevals in their project activities in order to start the chain reaction of increase in information field around the project. We want this case, which we are currently developing, would create a good format for work with adolescents within project management. Each project contains the wide range of topics, competencies and knowledge. Such project being implemented at school can become a point of assembly not only for students and teachers, but also for participants in development of the territory – administrations of the school, the town and entrepreneurs. We want the project sessions to become the first step to turning schools into centers of development of territories”, — said Aleksey Ilyin. He also adds that tomorrow will be dedicated to the ecosystem of projects, where participants will learn how to support each other. Electronic communication was created for this aim, and they are working in chat rooms. All this is fulfilled in the form of the live website that already exists and is edited in real time. Aleksey Ilyin marks involvement of the young leaders in the work, underlining that the youth of Yamal is distinguished with unconventional way of thinking, willingness to share and boldness in fulfillment of any ideas. It will give them the competitive advantage in the future. “The young people think on 5-10 years ahead, they have an image of the future, and it is great”, he said in the conclusion. According to a participant of the project session, a student of the 8th form from Nadym Dmitry Pestrikov, social project management is a popular direction and will be useful to him in the future. “I really like everything, honestly. There are good specialists here. I learned a lot of new and useful things for creation of social projects and their implementation”, he shared his impressions. Work on the project is scheduled from April to November of this year, defense of projects – for December of this year. The best participants of the startup will be given the status “The young leader of Yamal”. As we should remind, fourth Arctic educational forum “Leadership in the Yamal system of education: from breakthrough ideas to effective fulfillment of projects” is taking place in Salekhard. About 500 people are participating in it. They are leading Russian experts, representatives of municipalities of the region, executive bodies of the state power of the region, public organizations, regional and municipal mass media, employees of subordinate educational organizations, heads of educational organizations, teachers, schoolchildren and students.